Since the moment we are born till the day we die, our life is filled with countless colours of innumerable shades. While some of them make us feel cheerful and inspired, others impact us in a not so favourable way. It has a lot to do with who we are, what we are going through and what we desire. So naturally, in the ancient Chinese art of Feng Shui, colour plays a powerful role especially when it comes to your home. Walls and ceilings painted in certain hues, or furnishing in specific tones, can infuse your house with positive energy and bring good fortune. Now, the bedroom is particularly a space where the use of colours should ideally follow the principles of Feng Shui. This is that part of your abode, where you relax, sleep, dream, ruminate, and express your passion. And using the right colours can transform your bedroom into an oasis of serenity, rejuvenation, optimism and bliss. They can keep all your anxieties and stress at bay, and offer you mental and physical peace. So let’s find out what different colours can do for you. Blue is the colour of the vast blue sky above us. It is also the colour of oceans which end where the sky begins! The tranquillity and spirituality that blue evokes in a bedroom, is peerless. Observe how it has been used in the bedroom above. A part of the wall behind the bed has been painted with a gorgeous shade of blue, and a fair sized beach wall art completes the look. The rest of the room predominantly makes use of white. 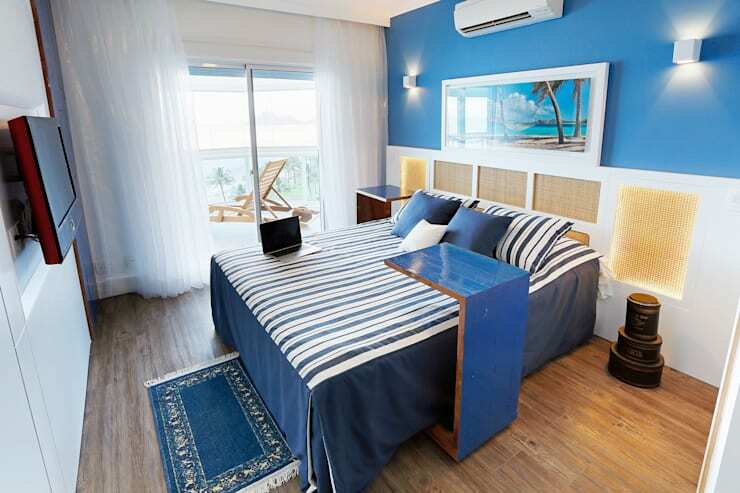 The blue and white bedspread and cushions lend a serene aura, along with sheer white curtains and a small blue rug. The wooden floor adds warmth and cosiness whereas, the large glass sliding doors let in oodles of natural light for a bright ambiance. Inspired by verdant nature, green shades represent life, vitality, abundance, prosperity, freshness and youthfulness. They also indicate new beginnings and hope, which make life meaningful. Green in Feng Shui is considered to be curative and good for your eyesight too. Take a look at the kid’s bedroom pictured above, to realize the wonderful enchantment of various shades of green, whether it’s used for walls, or furniture, or bedding. The beautiful wall flaunts a large, vibrant decal, and a bright green rug makes the charm of the colour more evident. You can profoundly feel the impact of green in this room, because it has been paired with white. If your taste is inclined towards light shades, then a light brown palette can do wonders for your bedroom. Brown is an earthy, warm, organic and versatile colour, which promises a balanced feel to any space. It can be nurturing for your soul when you are having a bad day, and yet keep you grounded when you are at the height of success. Brown has immense possibilities as is evident from this bedroom designed by Kristina Voloshina, an interior architect from Russia. The floor, the bed and the side tables are all crafted from light brown wood. 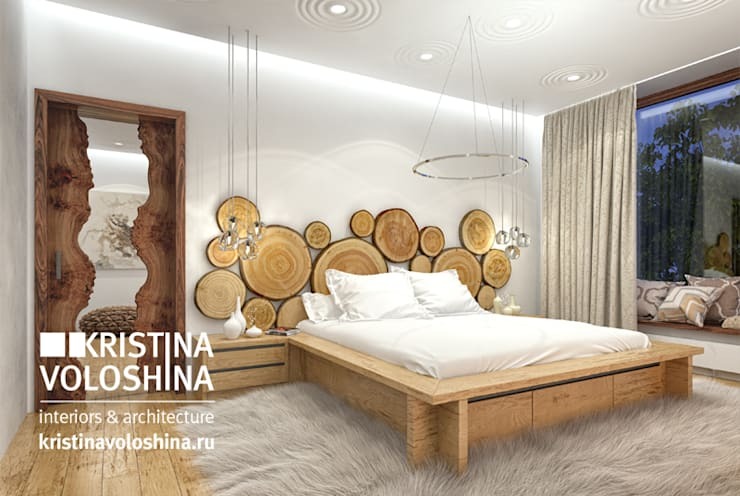 The set of tree rings which serve as an innovative headboard, exhibit interesting tones of brown. Only the bathroom door makes use of dark brown wood to make the beauty of the quirky mirror stand out. Note how the creative lighting and the plush rug enhance the sensuality of the bedroom. Love to live an opulent life or wish to attract more wealth? Then the royal aura of purple is just right for your bedroom. The colour stands for nobility, courage, wisdom, and is extremely rich. And there are so many shades you can play around with! The bedroom shown above, indulges in almost every kind of purple – lavender bed sheets, polka dotted dark mauve quilt and sofa covers, wall painted with a textured amethyst shade, and sheer curtains in violet. Lilac, brinjal purple, and plum are some other tones of this glorious colour. An all-purple bedroom is a good idea if you want a distinctly feminine touch. First things first, grey is anything but boring, in case you thought it is! It looks cool and sophisticated when used in a bedroom. The hue also signifies precision and sensibility in all walks of life. Since it is available in a wide array of shades, you can combine different kinds of grey to achieve the ambiance you want. Just bear in mind that, too much of grey in your bedroom may seem dreary or lacking in energy. To break its monotony, incorporate pops of bold colours as shown in the bedroom above. A dark brown rug, a bright yellow cushion, and a vase of greens add elements of interest. The white floor also complements the grey wall and bed wonderfully. For a gentle and calming bedroom, pastel shades are almost unbeatable. They exude comforting vibes and can induce relaxation in seconds. You can use soft, pale shades of pink, blue, green or yellow to produce the snug ambiance you desire in your room. Check out the bedroom above for inspiration. Everything in the room including the floor, bed, bedside table, bedding, and curtains look soothing and inviting. 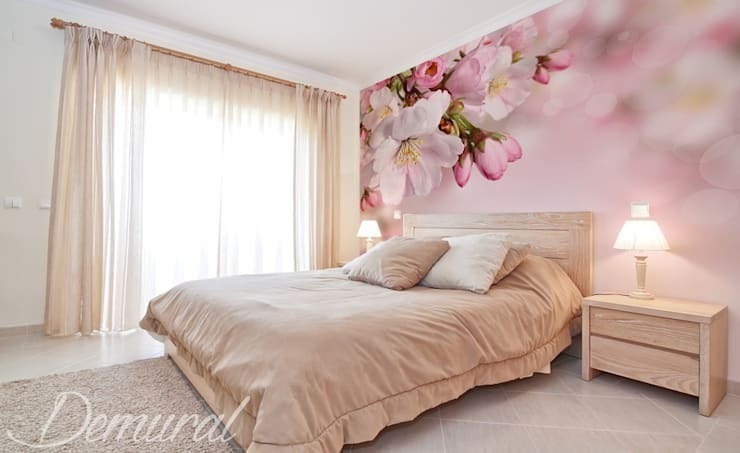 The wallpaper behind the bed is naturally the focal point of the room, and draws observers with its unique, floral magic. We don’t need to emphasize how bold and energetic red is, as a colour. It is impossible to find another hue which is more passionate, expressive, romantic, sensual and intense. And in Feng Shui, red is considered to be immensely lucky, since it represents the element of fire. It is believed to bring you happiness, power and fame. But an excess of red can be overwhelming in the bedroom. But when used in moderation, it can weave an otherworldly experience. In the room pictured above, one of the walls has been painted with a stunning shade of red. The other walls, ceiling and the bedding are in light tones to balance the power of red. The bedside lighting transforms the room into a luxurious getaway. Turquoise is the harmonious blend of two powerful Feng Shui colours, green and blue. As we have already seen, green stands for life, vitality, prosperity, while blue signifies serenity and spirituality. So turquoise combines the essence of these two different hues to bring you the gifts of knowledge, meditation and self-improvement. This elegant and delicate colour can be creatively used in bedrooms for a dramatic effect, as shown above. The turquoise wall lends a graceful air and hopeful vibes. The white and turquoise sheer curtains augment the fantasy-like feel of the room. Also don’t miss the beautiful white bird wall decal and the modern chandelier. Yellow is the colour of sunshine, sunflowers and rich butter. So it’s no surprise that it makes us feel joyful, spirited, invigorated and active! The hue can also be mentally stimulating, and is one of the most powerful colours according to Feng Shui. If you want to greet each new day with pleasure and positivity, try using yellow in your bedroom. The yellow wall in this bedroom can give you ideas. 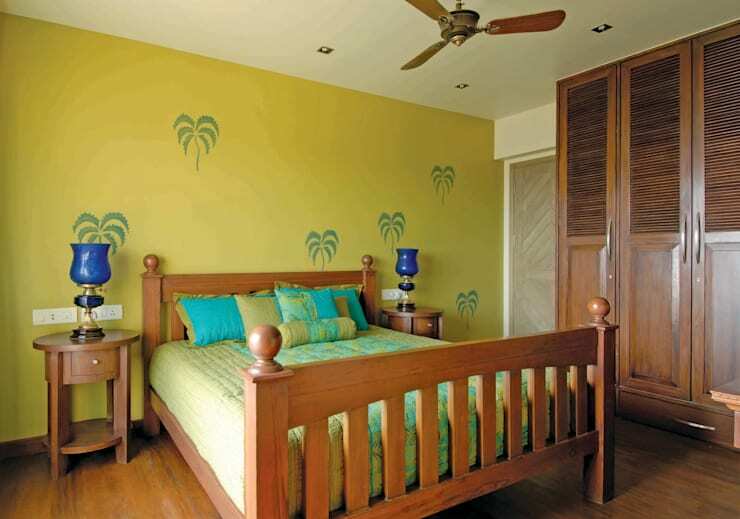 Note how the palm tree motifs create a breezy, tropical feel. And the wooden flooring and furniture add a sense of warmth and security. The bedspread, cushions and bedside lamps add dashes of blue and green for a natural ambiance. Feeling inspired by these ideas? You can also consult a Feng Shui consultant to assist you with the entire interior decoration of your house, to usher in maximum fortune, health and happiness. Here is another ideabook which might interest you – A quick guide to feng shui.